The D3S allows you to cost-effectively and discreetly monitor a large area, provides a sensitive, hidden, wearable radiation detector, that can identify radiological threats anywhere a terrorist or smuggler could go. The D3S is a light, wearable Radioisotope Identification Device (RIID) that allows you to identify radioactive threats swiftly, recognising the difference and classifies radioisotopes into medical and industrial sources and those that are more sinister. It provides a 100-fold increase in the ability to locate and identify sources of radiation at four times the speed of conventional detectors and one-tenth of the cost. Designed for fast deployment and ease of use, everything you need is in the box. These small and wearable detectors can go anywhere a terrorist could go, they are easy to conceal which makes them very hard to avoid because anyone could be carrying one, and they give the user vital information to react appropriately to a threat by identifying gamma-ray emitting isotopes and also, when present, detecting neutron radiation. Always on, ubiquitous monitoring using the D3S allows you to protect borders, cities, vital infrastructure and events from an evolving terrorist and radioactive material smuggling threat. Over 10,000 devices have been delivered, with the D3S being the only handheld detectors authorised by the DARPA Sigma Network. The system consists of a small, rugged detector paired to a mobile phone running the easy to understand identification app. The detector itself can fit into a pocket, belt pouch, or holder, which means users hands are free to do other things, the app can vibrate and audibly announce if gamma or neutrons are detected – this can be done via an earpiece. Always scanning in the background, the detector can identify a total of 37 isotopes, 17 more than the ANSI N42.34 RIID standard and does so four times faster than the RIID standard. The detector also recognises 69 unique signatures, which accounts for shielding and mixed configurations. The twelve-hour battery life allows the detector to last for the whole duration of your mission or patrol. The small size, light-weight, easy-to-understand display, voice announcement of isotope identification, the relatively low cost and hands-free operation make the D3S perfect for radiation security use by Homeland Security, military, hazmat, border patrol, counter-terrorism, law enforcement and event security staff. D3S ID is a rapidly deployable, self-contained radiation detection solution available for teams that need as few as one device to one-hundred. 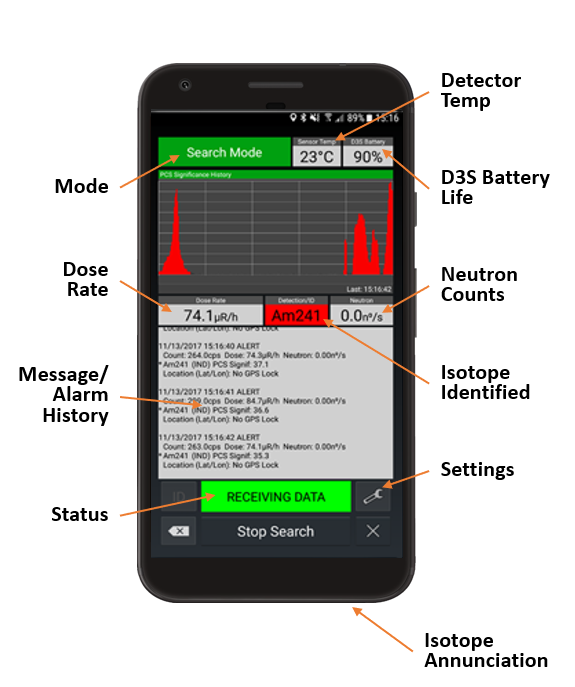 Each D3S ID reports its finding through a phone app showing radiation levels dose rate, isotope identification and neutron detection to the user. The user gets real-time alarm and adjudication in seconds and can react to the situation effectively. Perfect for deployment in large numbers with detector readings shown on the phone and mapped to a central control screen via the Sigma Network. The Sigma Network web interface allows for centralised and remote viewing of all detectors in the network. Since the radiation alerts are handled centrally, the D3S NET wearers do not have to be trained in your radiation detection protocols. Using the D3S NET; you can monitor the radiation levels of the whole city in real-time. 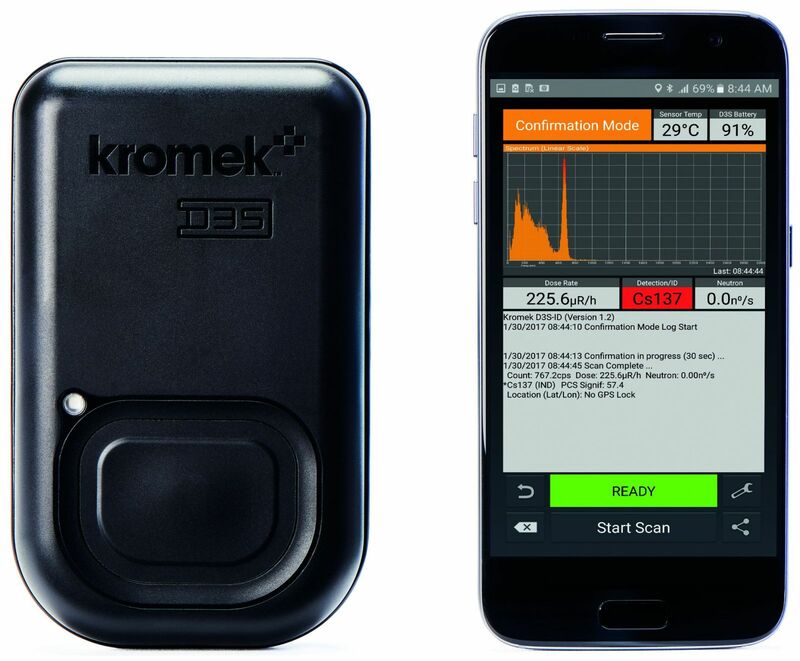 For a demonstration of the D3S and a full specification breakdown call +44 (0) 1740 626075, or email your contact details to sales@kromek.com and one of our experts will be in touch.